It's hard to be convinced that people are lying when they're telling mistruths, as opposed to purposely saying convenient things that may or may not be the truths and simply happen to be things related to a viewpoint or proposal or argument or belief that they support. Is that worse? 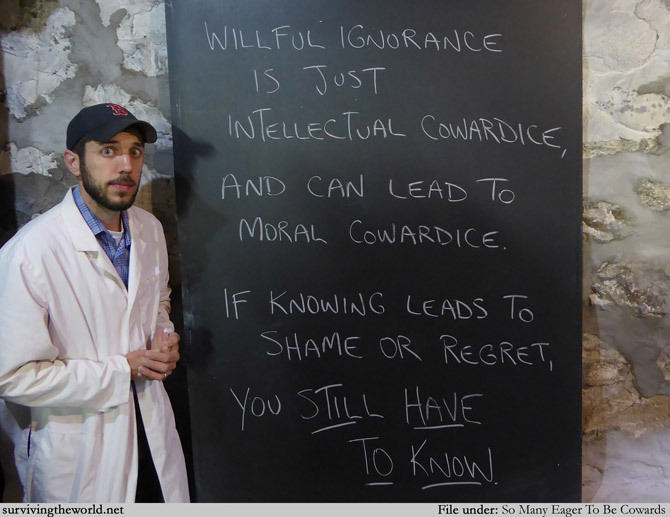 Is opening lying worse than being willfully ignorant? I don't know these things, I'm not a philosopher, despite claiming in my fake credentials on this site as having a Masters in Philosophy back when I insisted that Dante Shepherd was a real name and a real person. I think I've gotten off track here. What was my point? Probably about politics. That's a pretty good guess at this point what any STW is about. Ugh.